Nicole's Needlework: Earth Sampler Finished! I finished up Earth Sampler last night. It would have taken me less time, but I've been a little busy running around the last couple of days. The Primitive Needle "Earth Sampler"
I also started something new last night. I couldn't resist! I got the threads pulled and a couple pieces of fabric out and sat down with the pattern and saw that one of the pieces of linen was the exact size, count and color for the design, so I decided it was fate and had to start right away. The design is "This is the Day" by Hands to Work from the Jan/Feb 2009 Just Cross Stitch. A beautiful finish Nicole! Congrats!! And your new startdoes sound like fate! CUTE! Now I want to start Earth Day. You're a bad influence! ;-) LOL Harrison is just beautiful... I just love babies! The Earth Sampler is gorgeous. Looks fun too! I remember this issue. I believe it also had Tanya's Persuasion too. Nice start, Nicole! Congrats Nicole on a beautiful finish!! It is so cute and so pretty too! 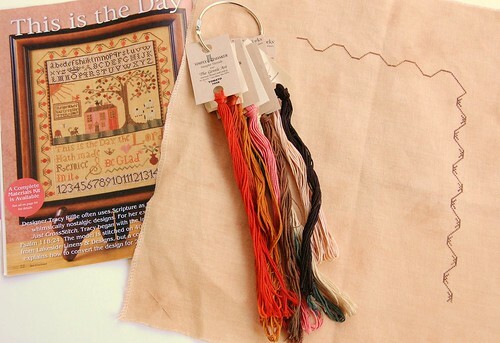 I saw this sampler in Just Cross Stitch and thought it was really pretty! I finally picked up my stitching yesterday and stitched a couple of small motifs on Quaker Virtue! I am going to stitch on it again today! I needed a little pick me up and that project is just the thing to do that for me!! I love it!! Beautiful finish! Is it one for the wall? When do you sleep? Your stitching makes me dizzy! what a great finish. I love the new design you are starting. I have been eyeing this one since I got the magazine. like you my rotation has taken a back seat. I am more inclined these days to just stitch on what I want when I want. Look forward to seeing progress pictures. Nicole, your finish is gorgeous!!!! I love it!!!!! And your new start!!!! I KNOW it is going to be gorgeous as well! Great choices!!! Earth Sampler is wonderful! I love your home-dyed fabric. Have fun with This Is the Day. I enjoyed watching Siobhan stitch it. Congrats on your finish and your start! Wahoo! Oh my, Nicole, it's lovely. Your needle is smoking. You started and completed it in the time that I've been *thinking* about starting it, LOL! What a great finish. It's so cute. And I love your next choice for a project. Everytime I see someone working on This is the Day, I want to also!!! It looks great Nitro! LOL do you just have a magic wand that you wave over your pieces????? i swear you do! I LOVE it! i will be picking up the threads in a couple weeks when i go to the LNS. The earth sampler is absolutely lovely! Can't wait to see more of your new start! Earth Sampler is beautiful! congrats on the great finish! Thanks so much for pointing out the wonderful JCS piece! I think I will kit it up to start on! A wonderful finish, congratulations. I love the little motifs and the bright colours used for them. Earth Sampler is just beautiful, you done an amazing job on it!!! I love your new project too!! I can not wait to watch your progress on this piece!! *sigh* I love Earth Sampler - it looks wonderful, Nicole! ES is beautiful. I must check my stash to see if I have it. Great job on the new start. You are bad, I pulled my magazine, threads and linen. No clue when I will have time to stitch it but it's so pretty. Love it! You did a beautiful job! Earth Sampler is gorgeous!! And you have a great start on This is the Day. I think it is really fun to stitch (although I think it "eats" thread--I have to keep ordering more skeins of a couple of colors). I hope you enjoy it just as much. Hi Nicole, Earth Sampler is lovely, as is your blog, my first time here. I've subscribed and also added link on my blog. WOW, your needle sure does fly~! Wonderful finish, I just kitted this up yesterday, but when will I get to it? That is the question! Ha! Enjoy This Is The Day, I have been working on it, and it is so enjoyable!! Be prepared for lots of fill in stitching though! Love the Earth Sampler. The new start looks luscious too. Love the color of the linens. I love this finish, very cute! The new start looks great. 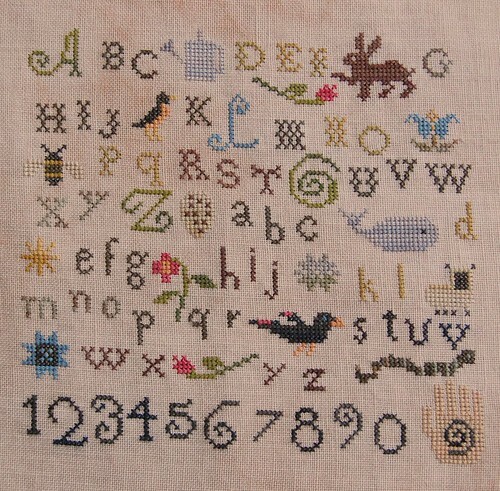 I just love the little animals in this sampler. Great job. Earth Sampler is a gorgeous - congrats on your finish. I like your new start too. Love your ES finish and your new start will be interesting. What luck with the fabric - definitely fate! Congratulations on a wonderful finish. A lovely new start too. That sampler wall is going to be full in no time. LOL! YOu aren't going to believe this...but I'm on the last line on my Earth Sampler and I pulled Hands to Work "This is the day" too...LOL! Great minds and all that, eh? Your Earth Sampler is gorgeous! Hurray for you! I *love* the Earth Sampler... nice finish!! oh, I tried the rotation thing and I just usually get side tracked or inspired to start something else so I know what you mean. The Earth Sampler is very pretty.